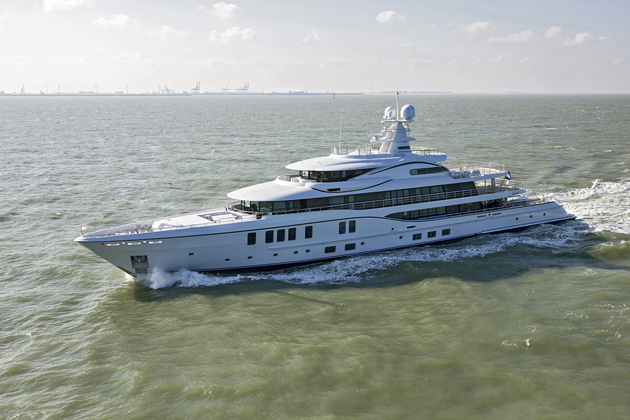 The first 74-metre Amels 242 has been photographed on sea trials in the North Sea, near Amels’ yard in Vlissingen. The yacht – the first of three 242s in build – was launched in December and is scheduled for an April delivery to her owner. The yacht was sold by Moran Yacht & Ship, who served as build consultants throughout the construction process. Tim Heywood styled the 242’s exterior, which features a 6.5m by 3.5m pool. A dedicated owner’s deck boasts 240 square metres of space, including a suite that has a superb view forward as well as an owner’s office. Guests will gravitate to the full-beam spa on the lower deck, with sauna, steam room and gym, and a fold-down beach platform. The watersports garage holds two 9.5-metre tenders. Andrew Winch has styled the interior, which includes two VIP cabins on the main deck, with each including an office, guest suite and dressing room. “We have created the perfect balance between full custom and semi-custom construction, proven by the fact that we now have all five models in the Limited Editions range in build, from the Amels 180 up to the Amels 272,” says Amels chief executive Rob Luijendijk.